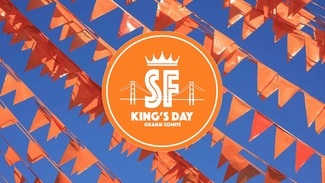 SF Koningsdag 2019: King's Day 2019 @ San Francisco is looking for you!! King's Day 2019 @ San Francisco is looking for you!! Dutch King's Day 2019 in San Francisco is looking for volunteers! We are getting ready for another fun-filled day at Golden Gate Park's Murphy Windmill and King's Day -"Koningsdag"- would not be possible without YOU, our volunteers. Thank you very much for your willingness to volunteer and for making King's Day 2019 celebration possible! As of this year we will have a Photo Booth where visitors can get there (funny) picture taken. We have all set up, just need somebody to make sure the visitors will be in the frame and the photo. Berend en bieneke, vanaf dat de muziek uit staat ok?